This is the nearest dream white beach near Manila. The sand here is more on the course side but it is okay for a weekend trip from Manila. We didn't stay overnight because it was too near from our home in the Philippines. This place has one big advantage--it's very near Manila. Unfortunately, this advantage is also it's major disadvantage. Laiya's proximity to the big city makes it expensive. Even merely hiring a hut for a day picnic will costs you 1500 pesos. Overnight rates in the peak season starts at 3000 pesos for a native fan room. If you bring your own food and drink be prepared to pay corkage fees. What I didn't appreciate in Laiya is that the beach is not for everyone. In Boracay, even if you stay in the cheapest possible place at the center of the island, you are allowed to go to the beachfront of Fridays or even Discovery Shores, in Laiya not. As soon as you walk on the beachfront of a resort where you are not staying there will be a guard shooing you away immediately. Even the locals are not allowed to enjoy their town because they are not allowed to go to the beachfront. I thought that beaches are public property. Private properties just starts so and so meters from the beach. Can a lawyer clarify this? W0w! this is also a nice resort. i want to visit here someday. I already been in Bauan, Calatagan, Cuenca, Calaca, Ibaan, Laurel and Lian. 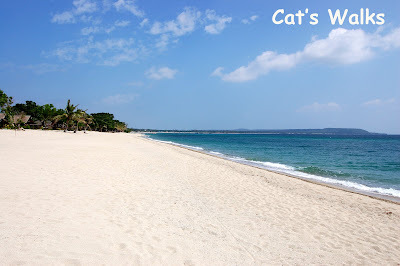 Planning to visit more beach reosrts in Batangas. I really love Batangas!